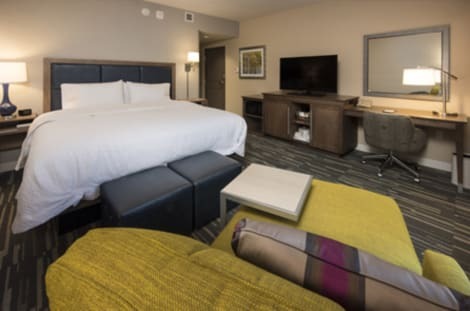 Experience a warm welcome at the Hampton Inn & Suites Seattle/ Redmond hotel. From the minute you step into the lobby, you’ll be greeted with fresh, vibrant décor and comfortable surroundings. We offer spacious guest rooms and suites equipped with an HDTV, microwave and mini-fridge. If you’re looking for more space, choose one of our suites and enjoy extra space and a sofa bed. Throughout your stay, you’ll enjoy convenient amenities like free WiFi and complimentary shuttle service.Start each morning with free hot breakfast or grab one of Hampton’s On the Run™ Breakfast Bags, available Monday through Friday. Our friendly team will be happy to recommend nearby lunch and dinner options. After a busy day, relax at indoor heated pool or take a dip in the whirlpool. We also offer a fitness center and business center, so you won’t miss a second of your routine. In addition to these amenities, our family-friendly hotel offers a guest laundry facility and on-site Suite Shop convenience store.Planning a business meeting or social event? 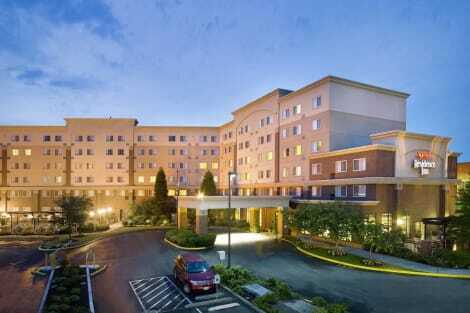 Our Redmond, WA hotel features 1,200 sq. ft. of flexible meeting space which accommodates up to 100 guests. Make yourself at home in one of the 262 guestrooms featuring refrigerators and Smart televisions. Your pillowtop bed comes with premium bedding. Cable programming provides entertainment, and wired and wireless Internet access is available for a surcharge. Private bathrooms with shower/tub combinations feature rainfall showerheads and complimentary toiletries. lastminute.com has a fantastic range of hotels in Redmond, with everything from cheap hotels to luxurious five star accommodation available. We like to live up to our last minute name so remember you can book any one of our excellent Redmond hotels up until midnight and stay the same night.